Movie Review: Wall Street-Money Never Sleeps- A Convoluted and Superficial Criticism of Modern Day Greed and Government Corruption That Lacks Essential Quality Characters | Generation Film! Just a little over 20 years ago overly hyped controversial director Oliver Stone targeted the greed and corruption he was witnessing in the financial trading markets of Wall Street with his appropriately titled film Wall Street. Wall Street is a relatively good film that boasts strengths in acting and characters rather than with its superficial look at greed and excess. Where Stone saw greed in expansion in the 80s you can be sure he’d have an opinion on the recent financial and housing market crashes and felt it appropriate (and it certainly feels desperate) to revisit his beloved character of Gordon Gekko by making a sequel to a film from Stone’s better days. In Stone’s sequel Wall Street: Money Never Sleeps it is clear that though there was a great amount of opportunity to be critical of the unethical playing field that government had set up for opportunist financiers there really isn’t any direction or aim in Stone’s film. Wall Street had an aim and though it was superficial it was made engaging through the characters Stone created. Unfortunately Wall Street: Money Never Sleeps doesn’t really introduce any new characters worth your time and are, in fact, horrifically cliché while at the same time lack coherent motivations for their decisions. Certainly the criticisms of government bailouts, risky loans, and complex financing can be felt throughout the film but because the film lacks the appropriate engaging characters, except for a returning Michael Douglas as Gekko, the film inevitably feels flat and aimless. Throughout the plot of this new Wall Street expose the new protagonist Jacob, played by Shia LeBeouf in an on and off performance, references ideas on evolution beginning with a bubble and the definition of insanity as doing the same thing over and over again and expecting a different result. It becomes pretty obvious that this is in direct line with Oliver Stone’s Marxist sympathies in a belief in dialectical materialism and how capitalism is just a brief segment in the evolution of markets that will inevitably become socialism and then communism. It seems Stone is criticizing the greed of financiers taking advantage of bad loans and complex derivatives and briefly mentions that the insanity part coincides with our government having bailed out these institutions before (i.e. Goldman Sachs in the 90s). Trying to criticize both government (bailouts) and greedy Wall Street (the buying out of businesses) could have been easier if Stone recognized the problems with corporatism corrupting the free market. Stone and his new screenwriters spread the script too thin in trying to tackle as many of the problems as possible yet not recognizing any of the symptoms and eventually guides Wall Street: Money Never Sleeps in a convoluted direction with no real characters to keep us engaged. Not only does the protagonist Jacob try to link up with a newly released from prison Gekko in a duel effort of gaining his knowledge and bringing Gekko back together with his daughter Winnie (Carey Mulligan), but Jacob also attempts to place himself in a competitive financing firm in order to subvert it because he blames the owner, Bretton James (Josh Brolin), for his previous mentor’s suicide (Frank Langhella). All in all the plot tries to involve numerous financing and economic criticisms but never really attempts to bring them coherently together mostly due to the lack of quality developed characters. Oliver Stone has had a good repertoire in working with actors; either it was the ensemble strength of Platoon or the tour de force performances of Tom Cruise in Born on the 4th of July or Anthony Hopkins in Nixon. However, the last 10 years there has been a steady decrease in dramatic strength from Stone either it be the Hallmark equivalent film known as World Trade Center or the laughingly languid historical drama Alexander. 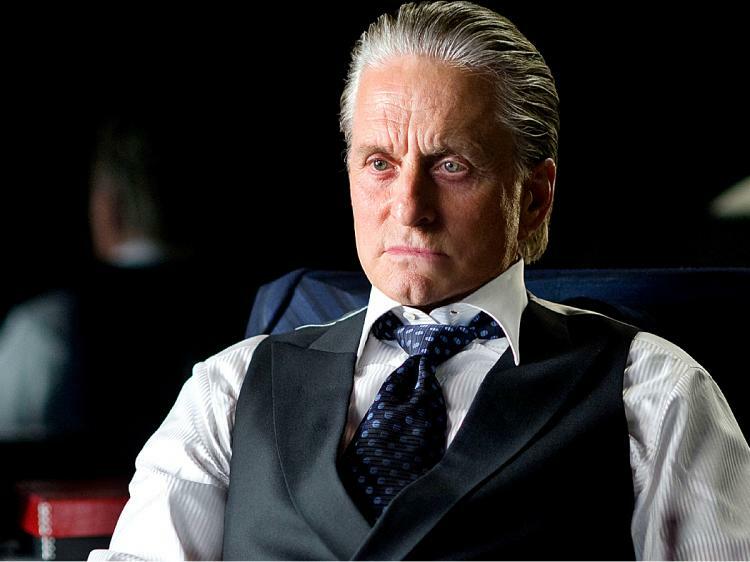 In the newest Wall Street the only actor who is able to hold his own is the already established character and experience of Michael Douglas as the slimy and arrogantly elusive Gordon Gekko. Beyond that the rest of the cast works as stagnant purposeless dolls in a superficial and aimless criticism of greed and government involvement with setting the corrupt playing field and bailing out bad behavior. Susan Sarandon’s character as Jacob’s real estate gambling mother is the definition of bad behavior being perpetuated since her son keeps giving her money after she throws it away in bad business decisions. So the framework is there and the characters had an intentional purpose but they all seem cold, distant, and undeveloped as they serve their purpose instead of growing or revealing more to us as the film goes along. Eli Wallach appears in a role that is strange and even alienating to the viewer as he makes weird noises and hand gestures that no reasonable human being would seem to make. The strength in the first Wall Street was the relationships that embodied the greed mentality and how the protégé and mentor set up was engaging qualities to witness unfold as Bud Fox (Charlie Sheen) got pulled in deeper and deeper into an unethical and greedy world. 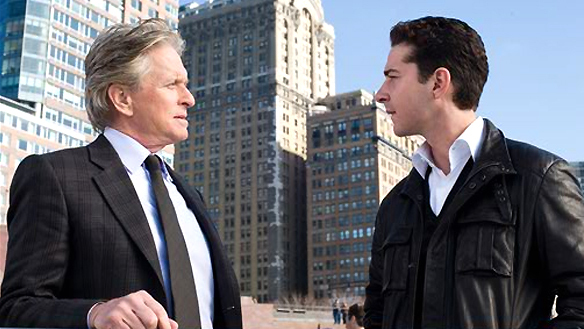 Wall Street: Money Never Sleeps tries to tackle too many difficult subjects while never really fleshing any of them out leaving behind an aimless film with stationary characters. 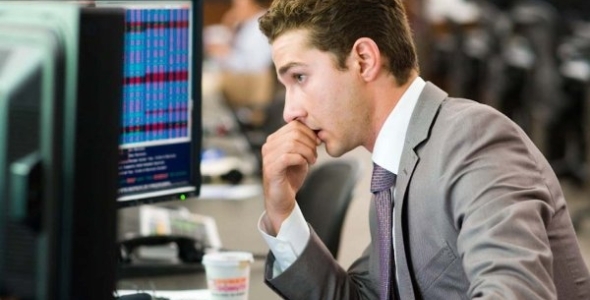 What is also unimaginative about Wall Street: Money Never Sleeps is a combination of a dreary and repetitive use of New York shots, bland cinematography, and an obscure use of editing that makes the atmosphere of this Oliver Stone film seem amateur and ultimately pedestrian. Strange cuts between phone calls showcasing unnecessary locations of green technology or splitting the screen between two locations was a sloppy choice in order to quickly handle establishing a couple of characters and their purpose in those particular places. Also having too many shots of New York serves only to elongate a film that lacks the proper substance needed to focus on the truly important aspects of the plot. Of course this particular plot doesn’t really have that much substance, just a superficial overview, than it is kind of expected to have the atmosphere of the city expand the already stretched out on screen story. And the cinematography was particular generic in comparison to Stone’s other work, especially considering Natural Born Killers and Salvador. As a sequel Wall Street falls drastically short of its predecessor but is consistent with Stone’s slow but inevitable downfall as an overrated and overly produced director. The quality of Stone’s films have been continuously decreasing for the past decade so it shouldn’t be a surprise that even a continuation of one of his overrated successes still wouldn’t be first-rate entertainment. Shia LaBeouf talking about evolution is sort of humorous when looking at Oliver Stone’s career since he has sort of devolved from semi-artistic eccentric to overly delusional fanatic. Whenever Michael Douglas possesses the screen in Wall Street: Money Never Sleeps there are some occasional enjoyable moments. However, these limited moments throughout a 2 hour film filled with cliché one liners and characters are merely sidetracks to a bland superficial and aimless criticism of modern greed and government corruption. Wall Street had some intriguing characters and their motivations were always coherent in relation to the plot and the intention of the script. But this time around Stone convolutes his script with too much to criticize and not enough developed characters to relate the message in a well done fashion.